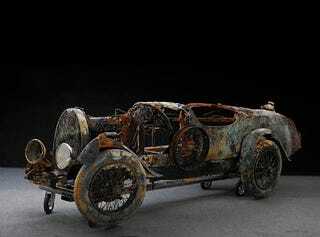 Despite spending the majority of its life under a Swiss lake, Bonhams expects this 1925 Bugatti Brescia Type 22 Roadster to go for between $100,000 and $130,000 at auction. Only 20 percent of its parts are salvageable. Details of how the Bugatti got the bottom of the lake are murky (har, har) but, it's thought that a wild young architect abandoned it at a lakeside construction yard and disappeared. Then, when the customs department showed up wanting their cut of the exotic roadster's MSRP, the hard-up construction workers pushed it in a lake to hide it. They connected a chain between it and the shore with the intention to recover the car once the revenuers had been fooled, but the chain rusted in-half before that could happen. In 1967 a local diver discovered the car partially buried in the lake bottom at a depth of 175 feet and its been an attraction for divers ever since. In 2008 a member of that diving club was beaten to death by a gang of youths, so the club decided to raise the car and auction it, with benefits going to a charity that works to address youth violence.